This regulator works with the two brush type generators. It will not work on the 3 brush generator! Although the principle of the two brush 12 Volt generator is the same as the 6 Volt, it can happen that the generator does not deliver output. The generator is self energising and should produce power when running. Most comment problem with these type of generators is the polarity of the remnant magnetism. After a repair, one can have interchanged the poles, so the polarity of the field is wrong. This can be corrected easily by flashing the generator. 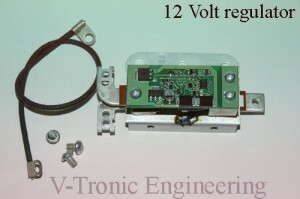 This is described in the installation instructions of this regulator, and can also be downloaded from this site. Be very careful if the generator has the wrong polarity! It means the generator’s output is negative! In the electronic regulator, a special circuit protects the electronics from being damaged, but is not capable of absorbing all energy, especially when throttling the engine. If the dashboard generator light does not go off when engine speeds is just above idle, then the generator is most likely negative polarized! Higher engine speeds ruins the regulator! Be very careful! The Electronic regulator needs a proper ground, made though the mounting flange. Be sure both metal surfaces are clean, so good contact is made. The Voltage must indicate a positive voltage. If not, the generator needs to be flashed. All products on this webpage are distributed by Samwel Supplies and can be ordered from your local dealer.